These glasses were originally dedicated for watching of an advertisement, but it's possible to see with them special 3D films, 3D photos and special pages in some magazines as well. To say the truth - there was not so much oportunities to see 3D pictures in that time. And so we decided to come with our own 3D club - with 3D photos and pictures - and with articles about how to create them. And with our own software, which makes it easy. The 3D club is here. 3DJournal.com. You can read here how to make 3D photos with an ordinary digital (or film) camera. You can find here an user guide for our software for creating of 3D pictures and 3D movies as well - it's name is the same as the name of our club - 3DJournal. Our pages are dedicated to 3D - exactly - to stereograms (stereographs), which can work thanks to the method, which is named anaglyph. This method uses the red/blue (or blue/red, if you wish) glasses mentioned above. 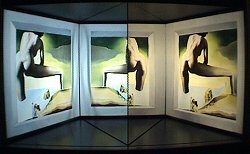 There are some other methods for creating and watching stereograms - some 3D pictures can be watched through special polarisation filters, others through special glasses with LCD shutters. But anaglyph is easy to use and cheap. It's big advantage is, that 3D photos, which you create as anaglyphs, may be seen on your monitor and on paper as well. We should say one more thing - about the museum mentioned above. 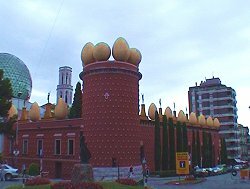 It's the Museum of Salvador Dali in Figueras (Espana). It is very nice - we really recommend it's visit. And now - we wish you a pleasant reading. PS: Some articles on 3DJournal.com are completely free for everybody. Free is the FREE version of our software for making 3D photos as well. You can choose and buy a subscription/membership, which contains an access to all articles on 3DJournal.com, 3D glasses, full version of the software and your own 3D gallery... We hope you will like 3D pictures, you will like to make your own ones and you become our subscriber/member. PPS: We are very happy when you send us your comments, ideas, questions... Our members can write to , authors to , the others, please, write to . We get a lot of e-mails every day. We read all of them, but we are sorry we can't answer to all. The maximal priority have e-mails from our members.